I had some left over polenta from the other day that I had poured into a pan. One thing I like about polenta is how it sets up, making a wonderful item for sauteeing to a crispy crust and then adding whatever suits your fancy. 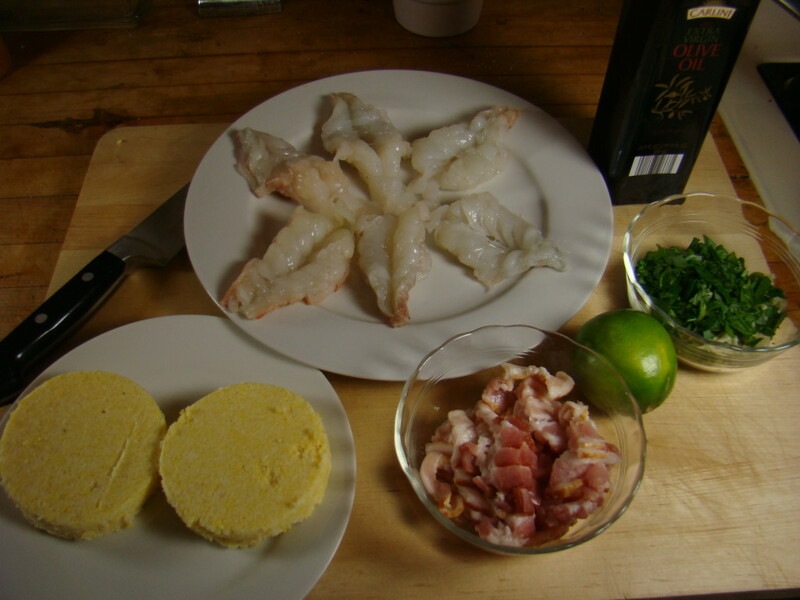 I’ve had a taste for shrimp and thought… hmmm shrimp n grits. But let’s tart them up a bit shall we? As in most of the things I make, nothing difficult here, but the outcome is delicious! Here’s how I did it. 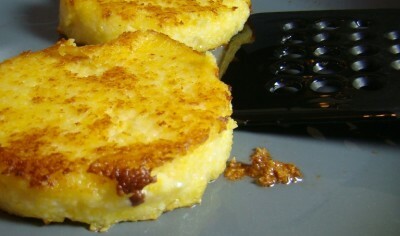 Add polenta to pan and brown on both sides. Remove polenta to oven safe dish, put in the warm oven. Wipe out the pan and add the bacon. Cook until fat renders and bacon is getting crispy. 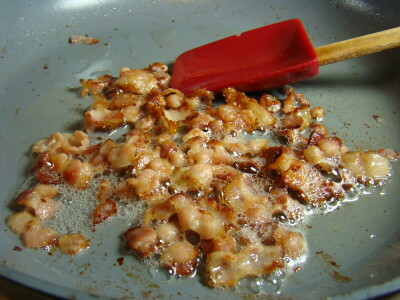 Remove bacon to paper towel lined plate with a slotted spoon or spatula. 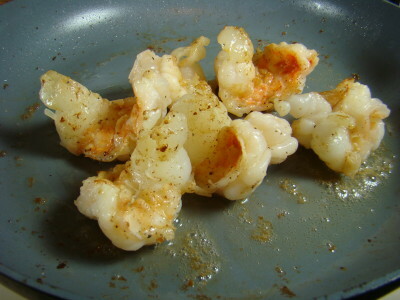 Add the shrimp to pan and cook until just cooked through and pink, about 2 minutes per side. Add the onion, garlic, parsley and lime juice. Toss to coat and remove from heat. I plated it up, puck on the bottom, three fat and succulent shrimp, some of the sauce and garnish with bacon bits. 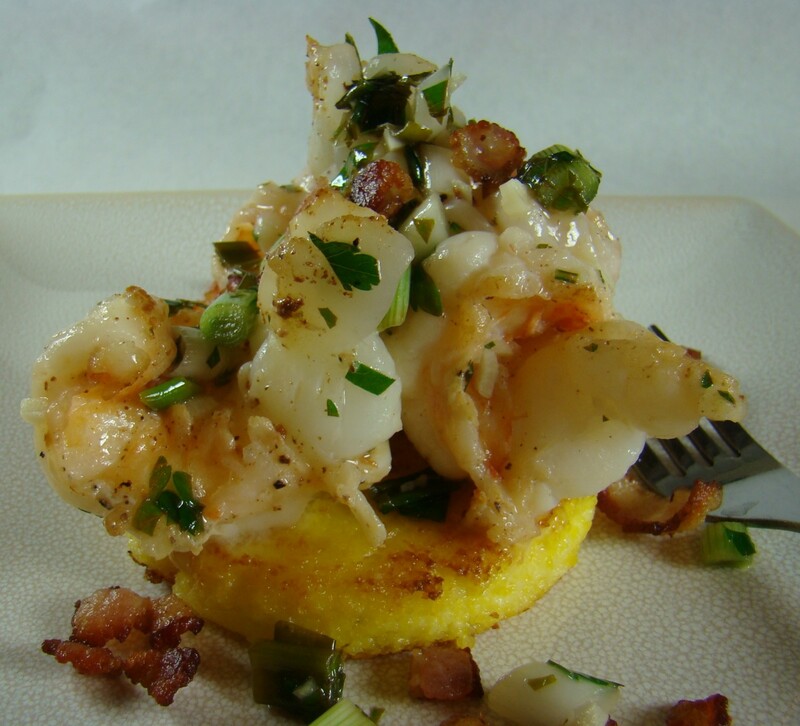 Creamy polenta with a little crunch, tender shrimp, the lime adding just the right amount of acid and tang, and the smoky bacon. No it’s not your grandma’s shrimp and grits, and yes, it’s a tad fussy presentation, but it was damn good! Put it on your menu soon! That is a very elegant dish, worthy of a top restaurant – I would make it if I liked seafood! I love polenta cooked like that, until the outside goes crispy. Thanks Mark. 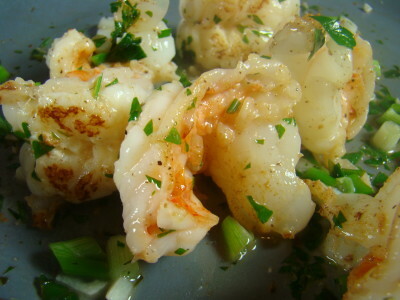 The shrimp were actually too big for the presentation I was looking for, but they sure tasted great! David, I had to run right over and tell a fellow foodie… tonite I roasted one of our meat chickens… it was a-maz-ing. I'm in a food coma – I am not even kidding. WOW if you can find a pastured chicken somewhere – pay whatever they are asking. And – I made polenta to go with it! I smiled b/c it matched this post. ps i'm heading over to your garden site now…. Awesome OFG, Got to get some local chicken. Sounds wonderful!